I’m writing from Nairobi…I was supposed to go to Mombasa this weekend, but I’m a bit sick – swollen glands and all that lovely stuff – so I decided to hang out here and rest. My friend Virginia and I are flying down to Mombasa on Friday for the weekend and then I’ll fly back to Nairobi and go directly to my flight home. It works out better anyway. In the meantime I’m back at the “easy surf” internet cafe and telling you all more of my stories. Sorry for the delay. It’s been a busy week. Lots of waiting around as is always the case in Africa. I’m staying at Jack Harris’s apartment near the museum (Jack’s one of the co-directors of the field school and a pretty well-known archaeologist…at least in those “archaeo” circles). It’s a nice set up and it’s great to have a place to stay where we don’t have to be paranoid about getting robbed and where we can cook our own food. Virginia and I cooked a lovely French dinner last night…yummy…I was in charge of the green beans, she handled the tarragon chicken and the potatoes. It was wonderful. I left off last time with Sosian, and although there are more stories to tell, I need to move on. I will only mention one thing that I’d forgotten…there are several species of weaver birds in Kenya and a couple of them were very verbal at our camp. They were so friggin’ cool. My stepdad would’ve been in bird heaven. They are very social and all of their nests are huddled together in the same tree. All those male weavers competing for the attention of females. I love it. Moving right along…we left Sosian on a Tuesday (I think), and began the long trek up to Koobi Fora base camp on the NE shore of Lake Turkana. The drive was an adventure in and of itself. Several of us rode on a military issue vehicle called the unimog (universal tractor in German). It’s a mercedes vehicle and quite a monster. It can ford mud or water up to 1.2 meters!!! Anyway, if you want to see one, you can probably google unimog…or just wait for my pics. Those of us who rode on the ‘mog stayed there for almost every long drive thereafter. 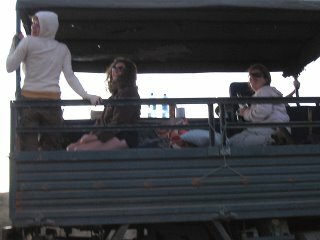 We became known as the dirty dozen because it’s an open air truck and the drives are usually quite dusty….no paved roads NE of Sosian. So it’s bumpy and dirty and diesely, but it’s heavenly because you see everything and we all had this wonderful comraderie. Mike (resident Brit) and Wayne (resident Kiwi…New Zealander, that is) brought lots of alcohol and Coke so they would make bourbon and coke and then pass it around to everyone. It’s difficult to express the hilarity that would ensue, but we usually ended up singing songs really badly. Matt (Ohio boy who loves musical theater) and I were often the song leaders. No surprise there. 🙂 Sadly, I’ve forgotten the proper verse order to American Pie over the years, so we never quite got it right. Ho hum. Whoever sat on the back of the ‘mog tended to get dirtier than anyone else and I have at least one pic that I’ll have to post when I get home of Matt after being on the back. I might have one of Scott also (there were two Scotts who became known as “positive” and “negative” due to their different attitudes on life…both actually really sweet guys). The drive up to Koobi took two very long days (we took 3 on the way back just to give ourselves a break). The first day we ended in Maralal – home of the world famous camel derby! I kid you not. They have a whole corral of camels there and there is an annual derby…people come from all over and I’d love to come to it one of these years. The campsite at Maralal was particularly nice because they have a bar and restaurant (and showers and toilets!). Granted, I had to wait about an hour and a half for my sausage and onion sandwich (all they had left, really) with chips, but man was it worth it! Oh…I’ve gotten used to calling “fries” “chips”…all that darn British influence. 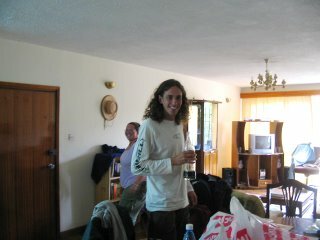 Plus, Maralal had cold drinks…a nice cold coke and a nice cold Tusker (local beer)…they were lovely. My tentmate for the ride up (it was easier to share than to put up my own) was Delora and she got quite drunk that night. Sadly, we staked our tent near a row of cactii and when she went to throw up she got a cactus prickle stuck in her forehead. I wish I’d taken a picture. She’s fine now, of course…it was only mildly scary. The next stop was South Horr…we got in the next night really late and had to set up with flashlights. That was a pretty basic camp. There was an outdoor shower surrounded by corrugated metal…no toilets to speak of…oh, except for the long drops but we couldn’t find them until morning and honestly the smell was so nauseating that I preferred to pee by a tree. 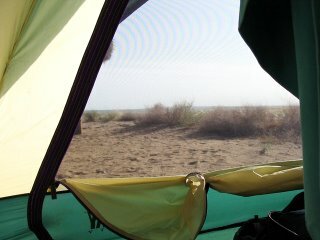 We woke up the next morning to the unfamiliar sound of a donkey hee-ing and haw-ing and running about 5 feet from our tent. It was easily one of the funniest moments of my life. I don’t know where he was going or who was chasing him (or her), but he seemed a bit spooked. Did you know that donkeys actually do make that hee-haw sound? Now the tv show “Hee-Haw” makes so much more sense to me. I used to love that silly show. 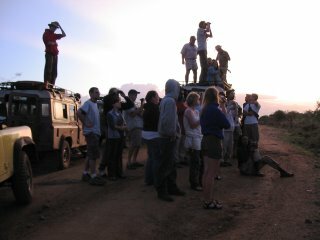 Anyway, some of the local Samburu people came out that morning and tried to sell us some stuff. It was quite nice actually. I got a couple of bracelets (one for my sweetheart 🙂 and a necklace. All made of local things like seeds. I’m glad I got them because although I’ve gotten other stuff since then, a lot of the goods we come across are not locally made. Some are, but you have to be skeptical sometimes…I’d see a lot of things that looked very Ghanaian. Sometimes I’d say “gee, that looks very West African” and they’d admit, well, yes, it’s imported. Not always though. That was mostly the case with textiles and drums. That day we drove for about 16 hours and finally got into Koobi Fora around 9pm. We had to wait outside the park gate for at least an hour before they let us in (Sibiloi Nat’l Park). Bureaucracy…I guess no one told them we were coming…even though the park was created in order to protect the fossils there, and even though the National Museums of Kenya are co-directors of the program and are the guardians of all fossils that come out of Koobi Fora…we still had to call one of the head honchos over at the Kenya National Wildlife Service to have him give the guard the “okay”. It’s cool though…I just curled up on the ‘mog and slept through most of it. The first thing I noticed at Koobi was the air…it was filled with little tiny no see-ums at night as well as the smell of the lake…a humid, salty/sandy smell. Oh…I completely forgot to mention our first view of the lake! Well, I’ll be sure to just post that pic because it was absolutely breathtaking…surreal…more spectactular than I could’ve imagined. Back to base camp…we all stood in line for the showers, set up our tents (some people slept in bandas…rooms basically, but ones that allowed for lots of critters to hang out) and ate a very late dinner before going to bed. 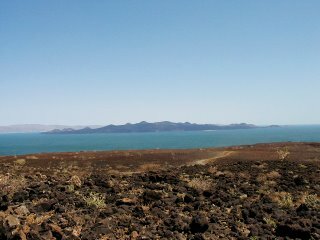 We woke the next morning to a beautiful site…Lake Turkana right at our doorstep. Well, actually it’s a 5 minute walk, but you wouldn’t know from just looking. It’s such a big lake…in fact I didn’t see a single croc or hippo the entire time we were in the region. Considering how often we swam in the lake, this is good…but also a little disappointing. Other people saw them…I just wasn’t there in time. Maybe next time. I did see a croc at the snake park at the museum, but seeing animals in captivity just isn’t the same. Well, this is quite a long one so I guess I should end for today. Maybe I can write more tomorrow, but maybe not….I’ll have to wait and see how things go. Next week I’ll be hanging out in paleontology at the museum. Emma (Emma Mbua – head of the dept) is letting me catalogue stuff for a possible master’s thesis topic. So right now I’m writing down just about every single Pliocene carnivore tooth, maxilla and mandible I can find. And there are many. I’ve already looked at several hyaenas, dogs and cats (canids and felids). I even got to see some Dinofelis specimens (“false” sabertooth I believe). It wasn’t as big as I’d expected…about the size of a modern day tiger. I love you all. Cheers. It would be friggin’ impossible to sum up everything that has happened over the past 6 weeks so I’ll just start from the beginning and try to give you an idea of what has happened. We left for Sosian Ranch the day after I last wrote. The drive wasn’t too long….maybe 8 hours or so and most of it was on paved roads. But I was in a land rover behind our big lorry (large green truck that carried 95% of our supplies…bags, cooking stuff, food, tables, water, etc.). The lorry has horrible diesel exhaust and I had a cold so it wasn’t a fun ride. However, the view of the rift valley just north of Nairobi is one of the most breathtaking things I’ve seen…especially because it was a clear day. On the way back it was a big foggy and cold, so the view wasn’t as awesome. Sosian is a 25,000 acre ranch in the Laikipia region of Kenya. It’s hilly, and at a fairly high altitude….not sure exactly how high, but it was noticable when hiking uphill. 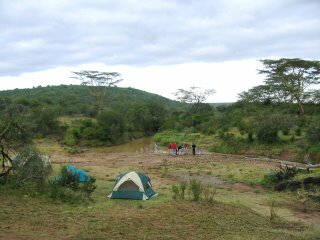 Our camp was on the Waso Narok (Narok river)…a perennial river that at the time was pretty much a trickle (we were there at the end of the long rains). 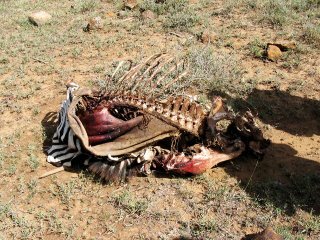 Our stay at Sosian consisted mostly of daily exercises in things like the local vegetation, taphonomy (study of what happens to bones postmortem, essentially), and geology. 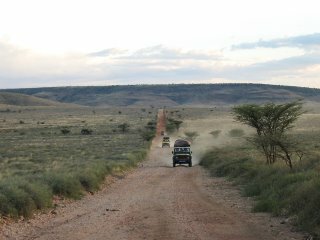 We also had game drives almost every day. I saw so many elephants that it almost became ordinary. But the most memorable elephant was the one that tried to charge the land rover that I was in one day. One of the girls and I were standing up through the sun roof taking pics of this young bull (big guy) and suddenly his ears started flapping (not a good sign). Next thing we knew we were jumping back down into our seats and everyone was screaming frantically to Emmanuel (our driv er) toback the car up. Unfortunately another land rover was behind us and they didn’t back up fast enough so we hit them and then the bull walk around to our left and was roaring at us. Finally Emmanuel floored it forward and the elephant chased us about 50 meters or so. It was pretty intense…talk about an adrenaline rush. One of the ladies in our group, a woman named Millen (she’s Kenyan and probably in her 40s) was from that point on terrified of the elephants. There’s something funny there, but I don’t think it will transfer well because I don’t know if I can convey Millen’s personality. Let’s just say that she was always grinning when she was expressing her elephant fears. Needless to say we all teased her (lovingly). The food at Sosian and the whole field school was decent, but nothing exciting. Not as good as Ghanaian cuisine, but at Koobi Fora we did get fish now and then (Nile perch, Tilapia, cat fish…usually in a curry stew…yummy). At Sosian it was mostly beans of various types. I ate just about everything I was given except for the mutton and goat. I just couldn’t bear to eat it. I kept thinking about the critters at Prospect Park Zoo. There were virtually no cockroaches for most of this field school, something that I greatly appreciated. Instead we had large spiders, but since they don’t scare me or even creep me out this was not a problem. On the contrary I thought they were awesome and took several spider pics. 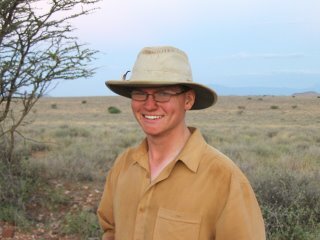 At Sosian we also saw a lot of ungulates (zebras, impala, dikdik, waterbuck, even a kudu and a tamed eland named Amelia…she was so cool!) 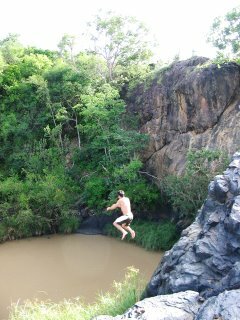 and some primates (vervets across the river from us and we saw olive baboons at a small waterfall…several of us jumped off of the waterfall into the pool below…I did the “low” dive…about 15-18 feet I’d say). We also got to see a lioness and her cubs from a distance. We saw more lions after leaving Sosian. We stopped at another ranch called Mugi and saw lions very close up…about 5-6 meters away. Beautiful. And on that note, I need to go meet up with my cohort and get some indian food (it rocks here by the way). We’re then going to go to the museum to see some hominin arm bones that they found last year. Probably belong to Homo erectus/ergaster. Pretty cool.